NEW YORK – In response to extreme, inflammatory, and willfully misleading rhetoric against state-level efforts to protect abortion rights and access in the State of the Union address this evening, Andrea Miller, President of the National Institute for Reproductive Health (NIRH), released the following statement. Miller voiced her unwavering support for state-led efforts to defend, protect, and advance reproductive freedom and denounced Trump’s “repugnant” remarks about legislation that safeguards women’s health throughout pregnancy. “Faced with historic unpopularity and widespread rejection of his agenda, President Trump used tonight’s State of the Union to peddle blatantly dishonest and debunked anti-woman and anti-abortion rhetoric,” said Andrea Miller, President of the National Institute for Reproductive Health. “Even for an administration defined by its hostility to the truth, Trump’s attempt to demonize abortion care and villainize women for making the decisions that are best for themselves and their families was repugnant. In particular, Trump’s attempt to distort a New York State law, the Reproductive Health Act, that simply secured the right to make reproductive decisions recognized 46 years ago in Roe v. Wade marked a desperate new low in our public discourse. Trump also reiterated grotesque misinformation about Virginia’s bill seeking to lift medically unnecessary barriers to abortion care. 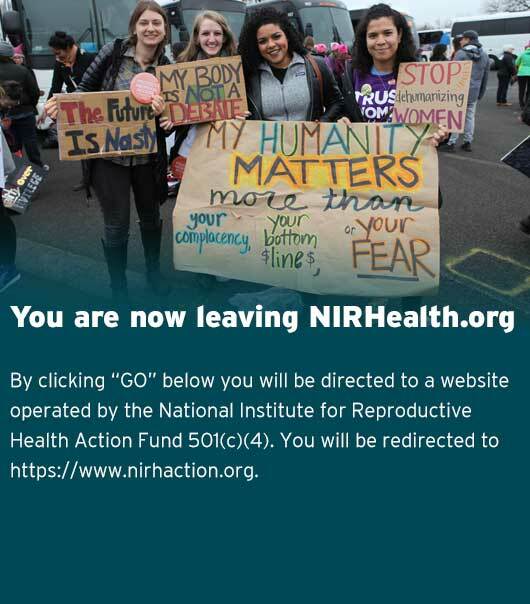 Tonight, NIRH launched a digital ad campaign to set the record straight and to remind the public that Trump aims to ban abortion and criminalize women and doctors — and for that reason, states are moving forward with a proactive agenda that pushes back. For more than a decade, NIRH has been a leader in the fight to advance reproductive freedom across the country. Most recently, they were integral to the successful effort to pass Massachusetts’ NASTY Women Act, which repealed the Commonwealth’s pre-Roe criminal abortion ban, and they led the fight to pass New York’s landmark Reproductive Health Act. Earlier this year, NIRH published a report tracking the passage of more than 100 bills to advance reproductive health, rights, and justice in 27 states and the District of Columbia (D.C.). Using a partnership model, NIRH provides state and local advocates with strategic guidance, hands-on support, and funding to create national change from the ground up. We form strategic partnerships with a wide range of organizations to directly impact the reproductive health and lives of women across the country. Each year, NIRH works in at least 20 states and more than a dozen localities; to date, NIRH has partnered with more than 150 reproductive health, rights, and justice organizations in 39 states and 56 localities across the country.